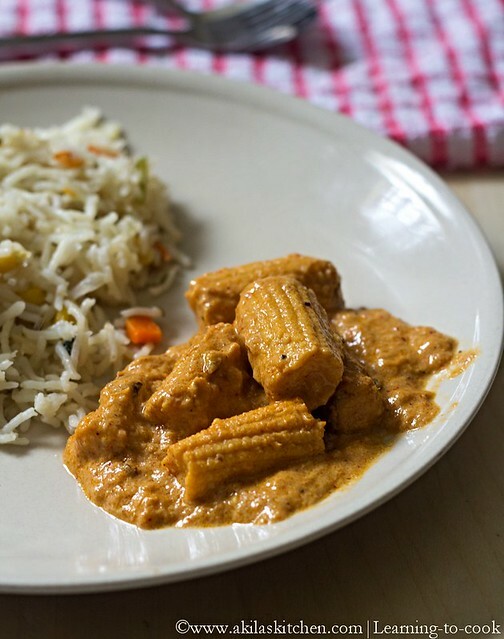 Baby corn masala recipe is a yummy masala recipe in which baby corn are cooked with Indian spices and tangy tomato and the cashews to give a rice taste. 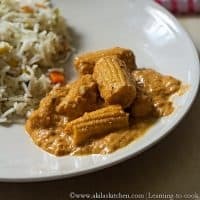 Baby corn masala recipe with easy step by step pictures and instructions for your easy understanding and learning. 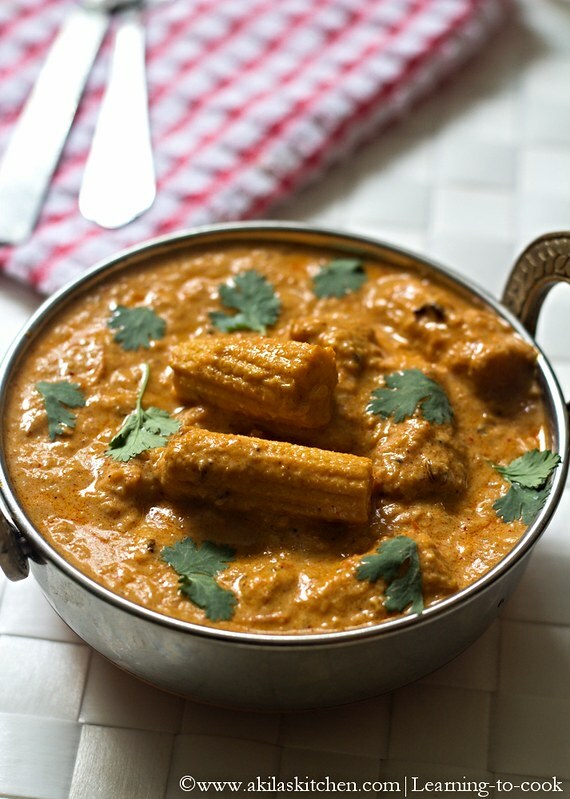 Baby Corn Masala: I was having 2 packets of babycorn lying in my fridge. Since that day was a Chinese New Year and all our family members were at home. So thought of trying something special for every one and tried this vegetable pulao and prepared the Babycorn Masala as the side dish. Everybody loved both the dishes. Let’s see the preparation of Babycorn Masala and in my next post, will see the vegetable pulao recipe. 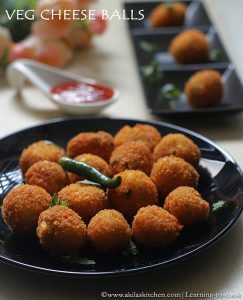 Also you can check the full collection of baby corn recipes. 1. Wash and soak cashews in hot water for 10 min. Grind it to a fine paste along with coconut adding little water and keep it ready. 2. 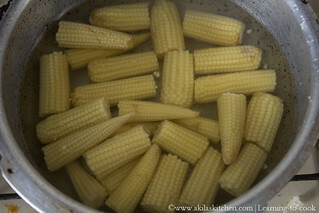 Wash and cut the Babycorn to your desired shape. Pressure cook it for 3 whistles adding little salt. 3. 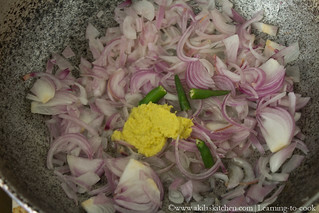 In a kadai or wok, add 1 tbsp oil and sauté the onion first. 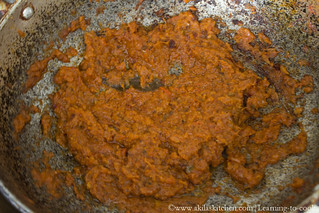 Then add the ginger garlic paste, green chilli and when raw smell of ginger goes, add the tomato and again sauté it well. 4. Cool the contents and grind to a coarse paste in a food processor. 5. 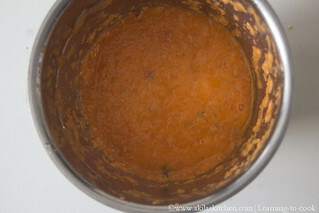 In the same vessel, add the oil and ghee and add the tempering items one by one. 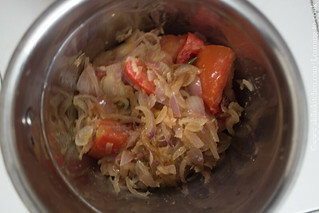 Now add the onion tomato paste and saute them well. 6. 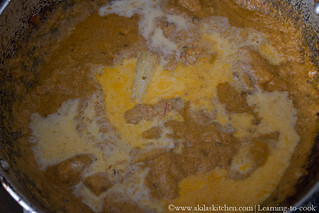 Add the chilli powder, turmeric powder, garam masala and salt. Sauté them nicely till the oil oozes out. This might take around 10 min. 7. 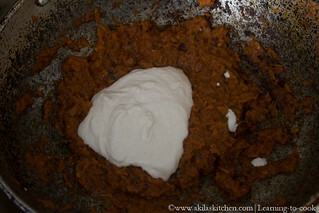 Add the cashew paste and little water. When it starts boiling add the Babycorn. Let the masala gets coated on the babycorn. 8. Add the cream or milk and allow to cook for another 2 min and switch off the stove. 9. Garnish with Coriander leaves and serve hot with chappathi or Vegetable Pulao. 1. Adding ghee is purely optional. But I feel, it enhances the taste. 2. Adding cream, gives richer taste. At the time of preparation, I do not have cream in hand and so added the milk. 3. Water can be adjusted according your required consistency. 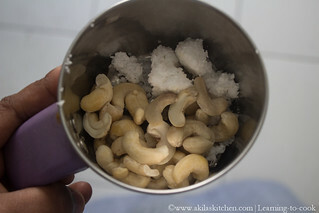 Wash and soak cashews in hot water for 10 min. 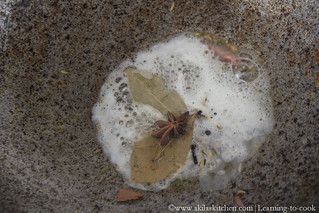 Grind it to a fine paste along with coconut adding little water and keep it ready. 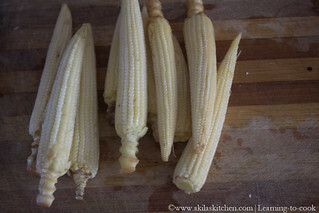 Wash and cut the Babycorn to your desired shape. Pressure cook it for 3 whistles adding little salt. In a kadai or wok, add 1 tbsp oil and sauté the onion first. 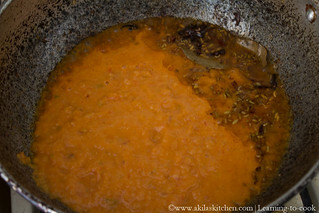 Then add the ginger garlic paste, green chilli and when raw smell of ginger goes, add the tomato and again sauté it well. Cool the contents and grind to a coarse paste in a food processor. 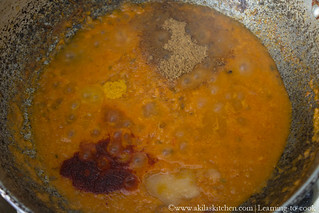 In the same vessel, add the oil and ghee and add the tempering items one by one. 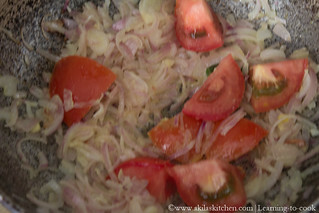 Now add the onion tomato paste and saute them well. Add the chilli powder, turmeric powder, garam masala and salt. Sauté them nicely till the oil oozes out. This might take around 10 min. Add the cashew paste and little water. When it starts boiling add the Babycorn. 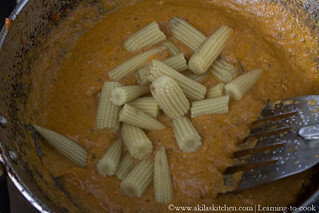 Let the masala gets coated on the babycorn. 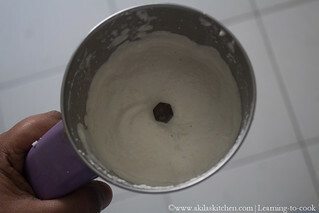 Add the cream or milk and allow to cook for another 2 min and switch off the stove. Adding ghee is purely optional. But I feel, it enhances the taste. Adding cream, gives richer taste. At the time of preparation, I do not have cream in hand and so added the milk. Water can be adjusted according your required consistency. 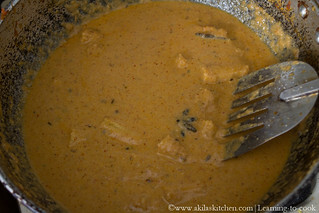 such a creamy and rich gravy.. wish I could taste it right now.. 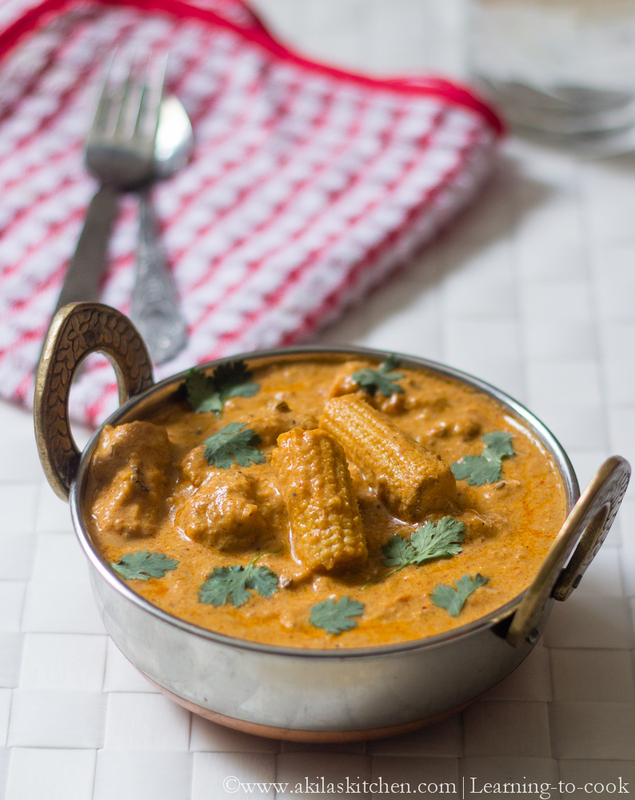 The addition of cashew nuts and coconut really worked so well for the thick loveable curry. Oh-so-yum! !